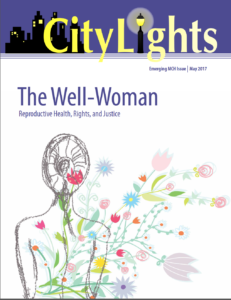 Download a PDF of The Well-Woman (2017) CityLights Issue. The well-woman is found at the intersection of reproductive health, rights, and justice. To improve women’s health and health outcomes, the MCH field must begin to focus on the health of the whole woman and ensure a woman-friendly health system for all women at the local, state and federal level. In order to create a woman-friendly health system, the focus must be placed equally on reproductive justice, health and rights. Addressing the complex health issues and health systems issues will require a complex solution. Simply addressing one component of women’s health will not be enough.